Lend a touch of loft worthy flair to your dining space with this elegant Chair. Inspired by the designs found in industrial uptown apartments and converted factory spaces, this chair will imbue your home with industrial flair and urban sophistication. 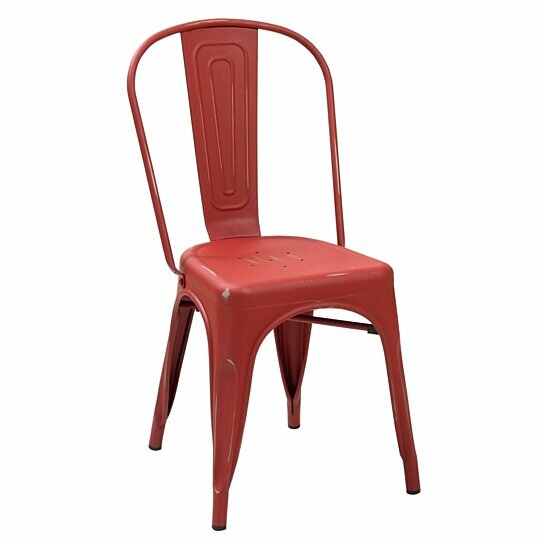 Made from metal in a distressed red finish, the frame of this chair strikes a simple silhouette with a high back for added comfort. The pierced details on the seat of this chair allows water to drain after the rain when placed outdoors, while the floor protectors on its legs prevent sliding and eliminate scratches on your floor. The chair has a weather resistant design and can be stacked on top of each other when they need to be stowed away. Note: Other featured items in the image except this chair are sold separately. The non-marking glides of this chair prevents floor scratches and carpet snags. The chair is made from solid metal that makes it durable as well as sturdy. Perfect for outdoors: Pierced details on the seat allows water to drain after the rain.